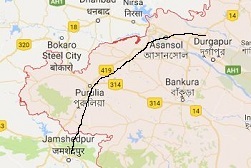 I was travelling by car from Jamshedpur to Durgapur1, at 2.30 in the morning, having completed my regular 18-hour work schedule. It was a hilly road, with high mountains on one side and the river and a deep gorge on the other. Overcome by the day’s exhaustion, I told my driver, Bhoori Singh that I would like to nap at the back. I was woken to the sensation of the car shaking. I looked up to find a trembling Bhoori Singh, visibly terrified, his eyes fixed on the road ahead. The headlights shone on a young mother leopard sitting in the middle of the road with two cubs, fear masked by her sharp gaze. The car was still moving. I asked Bhoori Singh to stop the car immediately. Given the nature of the terrain and my hours of work, I always travelled armed. I fired a blank shot in the air. Alarmed, the leopard jumped into the dark gorge and disappeared, leaving her cubs behind. There was no way that the mother leopard was going to be able to climb back up the gorge in the dark. I realised that if we left the cubs behind, they would not survive; they would either be run over, or fall prey to predators, or die of starvation. I decided to get the cubs. We wrapped them in my blue coat and as Singh was still somewhat jittery, I took the wheel and drove without halting till we reached the outskirts of Asansol2, to the only eating place, called Atwal’s. It was morning by now. From the shop next to it, we bought one feeding bottle and some milk. We fed the two cubs, each taking its turn before driving the rest of the way to Durgapur. I had a large warehouse with a partition for electrical equipment and several workers engaged. I decided to turn the empty part of the warehouse into a shelter for the cubs and assigned two men with the task of tending to them. A few months later, one of my cousins came to visit me and insisted on taking one of the cubs with him. I relented and later regretted because within a week, the cub died. He had apparently been given a bath and caught the chill. The other cub that remained with us, became our much- loved pet. It was a male cub and I cannot remember why we called him ‘Ruby’ but that was the name that stuck. My daughter, Kuku, would sit astride his back, hold his two ears and ride him around the large compound of our home, much to the consternation of my father, who always feared the worst. Ruby remained with us for 7 and a half years and why I had to part with him was to do with the ‘Memsahibs’ at work. I found Ruby in 1958. I had a contracting business in electrical works for the Durgapur Steel Plant that had been commissioned to a British consortium ISCON, comprising 13 member firms. 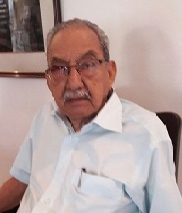 It was a prestigious project, one of the first in the newly independent India and my association with it had been due to the Director of the consortium, Major W.H.Aims, a war veteran. I met Aims earlier in Jamshedpur when he had been working for the Tata group. 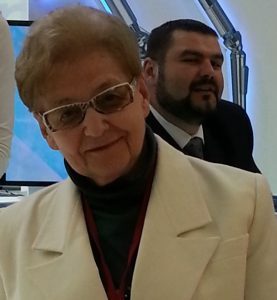 I was a young apprentice in our family business. A common friend, Dr. Sharma introduced me to him after our warehouse and adjoining showroom was burnt to cinders, causing severe financial distress; I had to start out on my own. Until then, I had been engrossed in my own world, very active in sports, representing the state of Bihar in hockey and cycling. In my youth, before India became independent, I was involved in students’ politics and in the freedom struggle. But that is a story for another day. Though I barely knew any English, Aims took an instant liking to me. He was a tall well-built man of over 6 feet. I was small and thin; however, I reminded him and his wife of their eldest son, Kenneth who had been lost at war. They called me Kenneth and a warm camaraderie grew between us. I was regarded a member of their family. My enthusiasm for engineering, despite not being a qualified engineer, impressed him no end. After working for two decades, Aims returned to England to retire and settle into a quiet life. However, when the British won government to government contract for building the steel plant at Durgapur, they looked out for someone who had prior experience of working in this field in India and was familiar with the practices and culture here. Major Aims was a perfect match and was offered the job of coordinating and directing the efforts. He agreed to come to India for only one year. Major Aims and his wife arrived in Calcutta and took up a room in the prestigious Grand Hotel. He contacted me soon after. We spoke about the project and my prospects of winning the contract for electrical works. He couldn’t directly help me with the contracts since these were to be decided by member firms like Stewart and Lloyd’s and Simon Carves. I made the necessary connections, thanks to the goodwill I enjoyed of Major Aims and supporting testimonies from senior officers I had worked with in Jamshedpur, and won the contract for electrical works in Durgapur. I met D.J.Bell (later knighted), who was quite a legendary figure in the field of engineering. As the work on the steel plant grew, there came to grow quite a community of British officials, workers and their families. There were as many as 960 British families living in Durgapur and they included only 36 qualified engineers in the 1960s. Ruby became quite a star in the colony. He lived with us at home and accompanied me to my place of work and charmed everyone by raising his fore legs in an act of salute, whenever asked to. He could distinguish a pebble from a stone or a brick as well as a wooden chair from a metal one and a sofa. When I asked him to sit on a metal chair, he would do so without ever going wrong. Similarly, with the sofa. He did quite a dance when instructed to catch his tail. Oh! he was an absolute delight and a heartthrob. Ruby was fed boiled meat with no hint of blood. His food bill ran up to 900 rupees a month, quite a princely sum in those days. Jack Harjes, not known to be a kind person, was a senior engineer working for Simon Carves. He insisted he must have Ruby and one evening took him away by force, ignoring my protestations. Ruby gave him quite a time, tearing his clothes and making a mess of his room. He was returned to us the next morning by a contrite Jack. I couldn’t keep Ruby for long after this. It was his popularity which proved to be his bane. 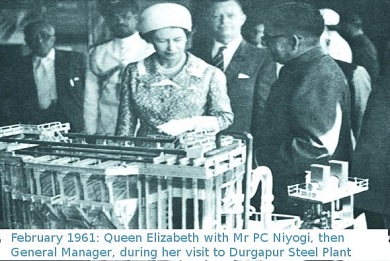 When Queen Elizabeth came to visit Durgapur steel plant in 1961, I was invited to meet her; I was introduced as the ‘The Man with the pet Leopard.’ The Queen was very keen to meet Ruby as well, but her tight schedule and security came in the way. The memsahibs3, however, would visit our home and the steel plant, sometimes unannounced, only to watch Ruby salute. Ruby was quite the ladies’ man and loved the attention. We seldom chained him. D.J.Bell, however, was afraid that in his excitement and enthusiasm, Ruby might jump on the women and frighten them, or spoil their dresses or even scratch them and hurt them inadvertently. He insisted that Ruby must be given away or put to sleep. My father heartily endorsed this verdict because he always feared for his daring granddaughter. 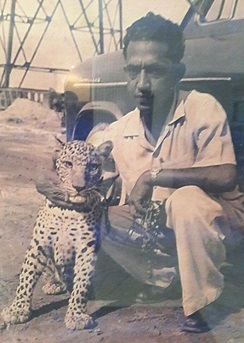 I took Ruby with me to gift him to the Calcutta Zoo but the Director declined to take him in, saying that he had been brought up with love and personal care and would perish in this new environment of the zoo. Finally, with a heavy heart, I let my zamindar friend Thakur Ram Singh from Patna take Ruby away with him. He promised to look after Ruby the way I had. There is an interesting twist here: Ram used to be a passionate hunter with many big game kills to his credit. He was transformed completely after he saw my affection for Ruby and our relationship evolve over the years. He had a huge estate with a large mango orchard and enough space for the grown-up cat, on the outskirts of Patna. The thought of parting and letting go of Ruby broke my heart. I did think of leaving him in the wild but then he hadn’t been trained to survive in the jungle. I resisted the idea of letting go of Ruby for as long as I could. Meanwhile, Durgapur had grown and so had my fame as the ‘Baagh Babu4.’ Visitors started flocking my home and place of work. The pressure grew from my family, the district administration and of course, Bell persisted. The District Magistrate and the Superintendent of Police, both of whom I knew well, paid me a visit one day, to inform that they had had instructions from their headquarters in Calcutta that Ruby must be taken away under the newly enacted Wildlife Act. I was thus left with no choice but to let Ram Singh have Ruby. I happened to visit Patna a couple of years later and went to see Ruby. He must have got my scent even as I was approaching the estate because he began growling loudly. He was now in a cage. As soon as he saw me coming, he jumped all over in great excitement running from one end of his enclosed home to another. I asked Ram Singh to open the door of the cage. Singh wasn’t willing for he was afraid Ruby would hurt me or someone else. I told him not to worry. I opened the door and went inside. He was beside himself with joy; we hugged one another and caressed, Ruby jumped, purred and played, licking me to demonstrate his love and happiness. I had to leave and Ruby had to resume his life in the enclosure. I never again went to see him or asked after him. It was extremely painful. Loved the story. It must have been an amazing experience! Interesting read, but I couldn't help thinking that perhaps the story could have had an early ending if only the author had dimmed the lights and sat quietly in the car for a few minutes, allowing the leopard to guide her cubs away from the road, instead of firing in the air, scaring her and making her flee.